Neal Chin held a great workshop at the store. Paul Tillery joined him on stand up base for a fun demonstration. We will definitely have Neal back again. February 24, 2016 Dani Joy and the Boys held a workshop and demonstration at Hale Ukulele's new classroom. They were AWESOME!! A fun time was had by all. If you were one of the unlucky ones who were not able to attend and grab one of Dani Joy's CDs, we have them available at the store. Be sure to stop by and pick one up. We are so incredibly proud to present, January 2016, Aldrine Guerrero & Kris Fuchigami. You don't want to miss either of these amazing teachers AND performers. You'll learn so much from these guys. He will be teaching a one hour workshop AND then doing an hour demonstration following. He doesn't stop in San Diego very often, so don't miss out on this rare opportunity to meet and learn from Mr. 'Ukulele Underground himself. For those of you who do not know who Aldrine is- he is the face of 'Ukulele Underground. This website started as a way to have a central place for all things 'ukulele, including free video lessons. Since it's humble beginnings, 'Ukulele Underground has grown and is recognized WORLD WIDE. Aldrine has performed and taught all over the world and currently lives on the island of Kauai.. We are incredibly lucky to have him join us in January. Kris is renown for his amazing instrumental abilities. Not only does he play music beautifully, he writes his own songs as well. He will be teaching an hour workshop followed by a demonstration. Growing up on the big island of Hawai'i, Kris started his musical journey at the age of 13. Since then he has performed with renown musicians, such as Jake Shimabukuro, Mark Yamanaka, Daniel Ho, and Brittni Paiva. He was recently featured in 'Ukulele Magazine for being one of the "Up and Coming" artists of Hawai'i. His career is gaining some serious momentum, so don't miss out on this rare opportunity to learn from him AND see him perform. Because of the popularity of our workshops, we have decided to expand and have a larger space! We were expecting to have it ready by January, but it will be opening in DECEMBER! You will still come to the original Hale 'Ukulele Storefront to sign in, and be directed to the new space, which is just a few yards away. We will have a small celebration December 12, at our DOUBLE Workshop with Craig Chee & Sarah Maisel. Please join us at 1PM for Sarah's workshop, then stay for free snacks and Craig's workshop! Craig will be making his famous Spam Musubi, so don't miss out! 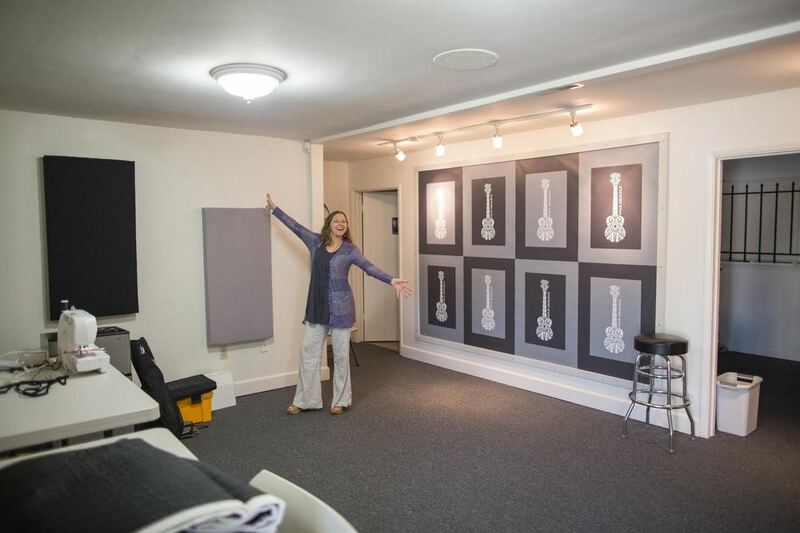 With this new space, we are hoping to bring in even more teachers, allowing the uke community to grow. If there are any teachers you'd like to see, please let us know! Please share this great news with your friends. We also plan on having on workshops for U-Bass, Music Theory, and MORE! Our space is also available for rent for your uke jams, or any other group activities, just give us a call (858)-414-4492. We've had the best two weeks ever! But let's start with today. We met with Daniel Ho and Pepe Romero Jr. to chat about Pepe's 'ukuleles and guitars. The instruments are beautifully designed and built. The unique design is in part to Daniel Ho. We got to try out the Extra Small Soprano, Tiny Tenor, Grand Tenor, AND the Pepe Romero Signature. All there is to say is WOW. Oh, and one other thing- you can NOW GET THEM here at Hale 'Ukulele! Please feel free to look at the Romero Creation website for more information. Come to the store and see how great they feel and sound. As you can tell from the photo- it was quite a treat to be visited by these two. And to think, Pepe Romero Jr. is right here in San Diego! We will also be carrying Pepe Romero Jr.'s custom string sets as well. 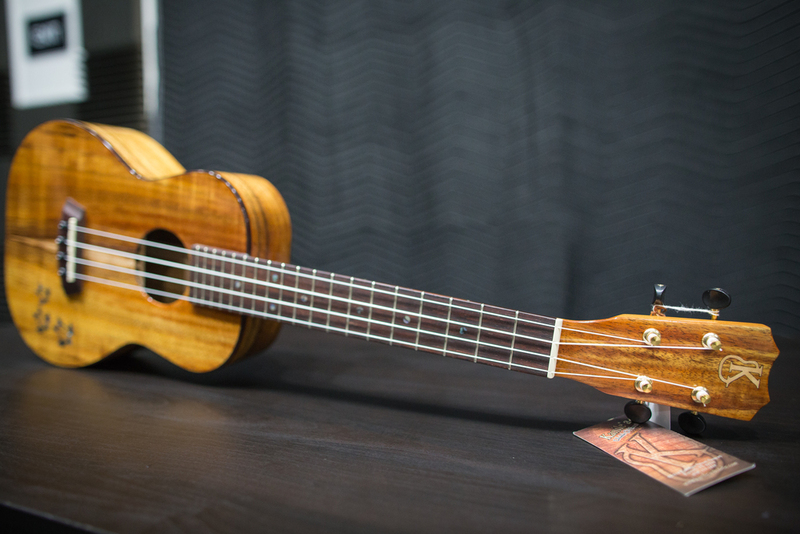 Try them out to give a new life to your 'ukulele! Hopefully we can get Daniel to come down from LA and do a Master Class... Keep your fingers crossed. Also in stock, we have gotten in some great new instruments. Kimo 'Ukulele has dropped off another fabulous Whale inlay uke! We have also gotten some new Kanile'a and Pono! All the more reason to stop by and check out the store. We just got an amazing shipment of 'ukuleles from the island of Oahu! 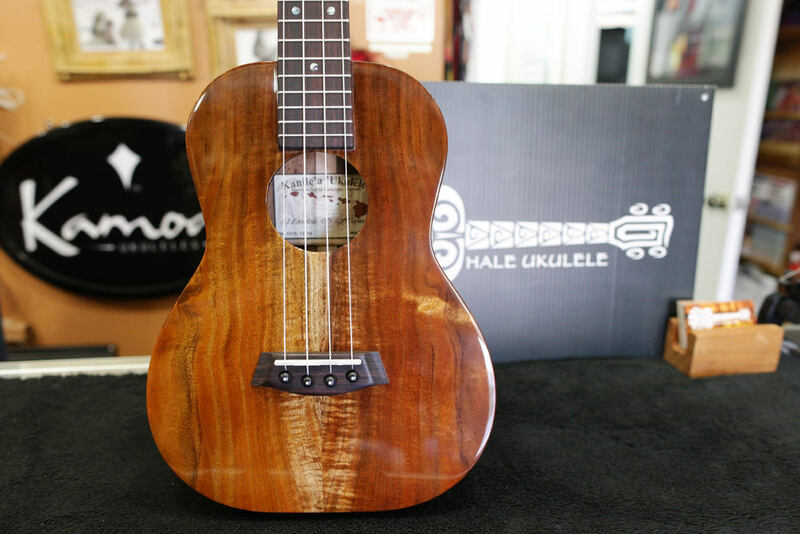 Come in and check out these brand new Kanile'a 'Ukuleles. They sound just as amazing as they look, so make sure to stop by and see for yourself. 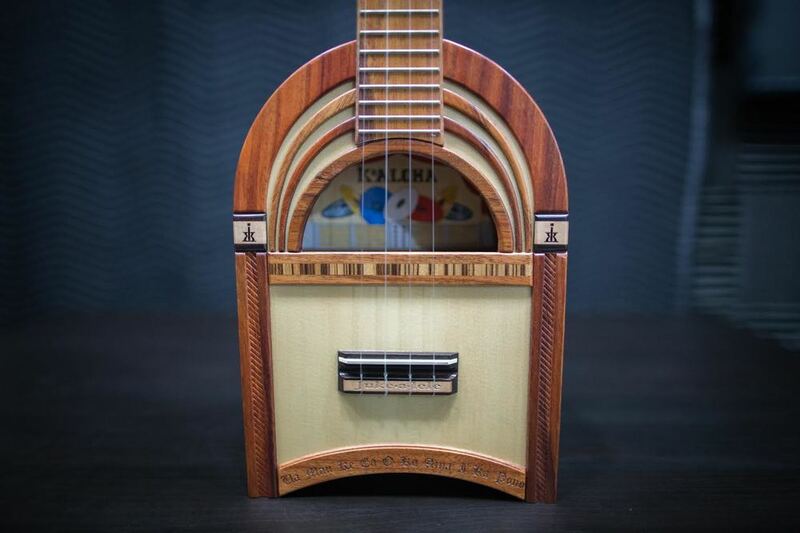 Another amazing instrument you can visit when you come to the store is this rare KoAloha "Juke-A-lele". It is modeled after a vintage 1950's Jukebox and has an amazingly bright and loud sound. You've got to hear it to believe it. It's a joy to play and looks cool too! 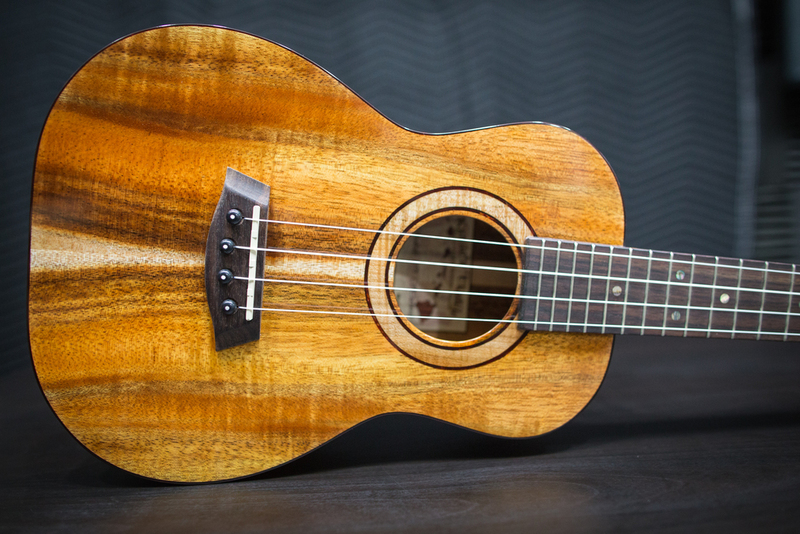 From the island of Kauai we have some new Island 'Ukuleles! 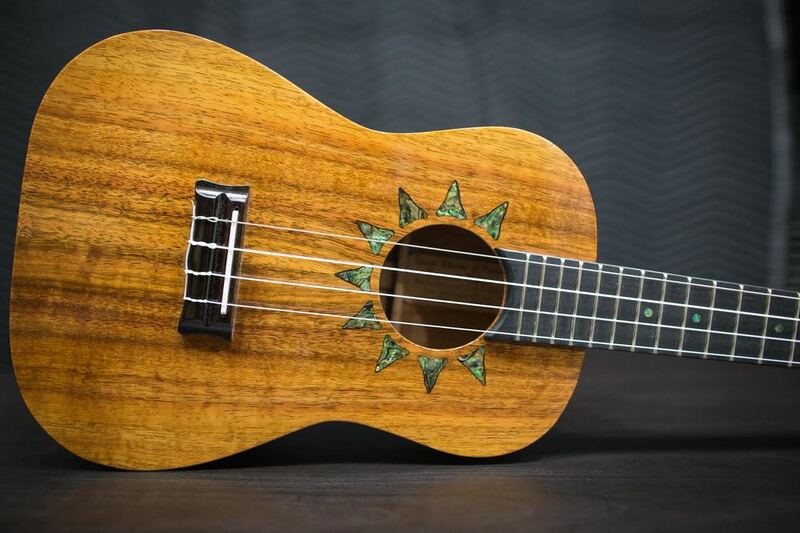 Check out the beautiful inlay on this amazing tenor uke. We are so proud to carry this brand of hand made 'ukuleles.